Kastelli (population 4000) is a small on the north-west coast of Crete, 40km to the west of Chania and 15 km west of Kolimbari. The town is known by two names, Kastelli and Kissamos. Kastelli is one of the few remaining towns on Crete which has not succumbed totally to the annual invasion of tourists. 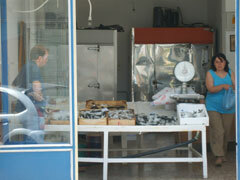 Its main business is derived from agriculture; so many tourists find little of interest to keep them there. There are no ‘big sights’ in Kastelli. In the town centre there is a large square, surrounded by the usual shops, restaurants and bars, in which Cretans play backgammon and card games. The ambiance is very much reminiscent of the Crete in old days. In recent years there have been efforts to improve Kastelli’s image. A new archeological museum was opened a few years ago. Entry to it is free, and you can find it on the main square. The promenade has been modernised, and may good, cheap restaurants have sprung up along the waterfront. 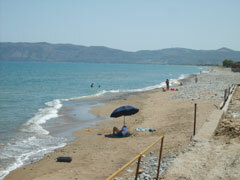 Accomodation in Kissamos : Kastelli has two campgrounds, one in town, the other 6km out of town. The in-town campground is quite pretty, and has a big, clean swimming pool. Most people consider the out-of-town campsite to be nicer, however. 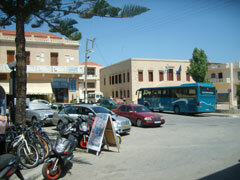 There are a few hotels and rent-rooms in Kissamos, all of which are quite cheap. Connections Kissamos: Some tourists come to Kastelli in order to catch the maximum twice-weekly ferry to the Peloponnese. This ferry is the shortest route to the mainland, but is not notably cheaper or quicker than ferries departing from Chania and Iraklio to Athens. There are around ten buses a day between Kastelli and Chania and one to the Elafonisi beach. Falassarna: Three buses a day go on from Kastelli to Falassarna on the east coast. This village is popular with individuals seeking a tranquil retreat with a stunning landscape and nice beaches. People also visit to view the remains of the ancient town of Falassarna, which existed in both Minoan and Roman times. 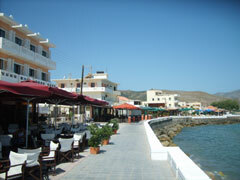 Falassarna is served by the usual array of tavernas and accommodation. The locals are friendly with visitors to their town, who increase in numbers every year. Platanos: A virtually tourist-free village 5km above Falassarna. 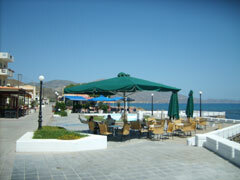 There are a few places which rent rooms and a couple of tavernas with hearty Cretan fare on offer. All buses to Falassarna go through Platanos.